The subfloor is the base for your flooring. Having the right subfloor is just as important as choosing the right floor finish, even if it’s going to hardly ever see the light of day. Vinyl, laminate or tile or even expensive hardwood – doesn’t matter which one you choose, without proper support their durability will be compromised and you’ll end up wasting your money. Who wants that? Noone! Here is how to make sure your subfloor is the right choice for your desired flooring. Subfloor is the very bottom layer of the floor that sits directly on the joists. Once the floor is installed it, subfloor gets hidden underneath. Because it’s hard to reach position, making changes to a subfloor is quite an expensive and difficult endeavor. Most subfloors stay the way they were built during the construction of the house. The most common subfloor is 1/2″ or 3/4″ A/C-graded plywood. A/C means that the boards are smooth on the top side and rough on the bottom. Oriented-strand board (OSB) also known as flakeboard is an alternative subflooring material. As a composite material, it shares great similarities with plywood. A single sheet of OSB is made by sealing large flakes of wood together with phenolic resins. Subfloor is not to be confused with underlayment. Underlayment is what comes between subfloor and flooring surface to guarantee your floor’s best performance and keep the moisture and noise away. 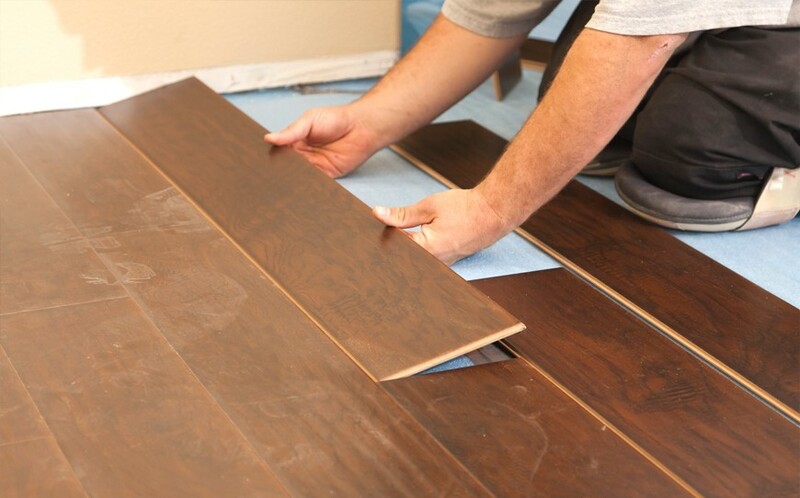 While subfloor is typically standard and consistent throughout the entire home, the type of underlayment used can vary from room to room depending on what type of flooring is being installed. Cement board is the underlayment to use when installing tile flooring. It sits on the plywood or concrete surface and holds the tiles together. Foam and cork padding is the most common underlayment for laminate floors. Laminate is a hard floor and can often feel uncomfortable under your feet. The padding underneath helps cushion your step. Plywood can also be used as underlayment. It adds strength and helps set the height of the finish floor. In this case, you’ll have two layers of plywood present, one a subfloor layer and one an underlayment layer. If you are installing hardwood flooring plywood is the best subfloor for you. Any plywood ranging from 1/2″ to 3/4″ and rated A/C will serve both solid or engineered hardwood well. If you decide to upgrade your subfloor choose tongue and groove plywood. It’s easier to install and will minimize squeaks caused by walking. Laminate can also be installed on a plywood subfloor. However laminate is a fairly thin floor so adding thin plywood as a secondary subfloor is advised, especially if you are installing laminate flooring in an older house. Subfloors in older houses are often no thicker than ½’’ plywood, unlike the ¾’’ thick layers in newer buildings. Because laminate is so thin it can easily show imperfections. To protect your flooring from grooves and dents you should install an underlayment, best foam or cork padding to provide some give and help smooth out any imperfections of the subfloor. The main danger to tile flooring is cracking. Old and infected joists can be a cause for fractures. Installing stable plywood subfloor will help prevent any movement that can lead to damage. Underlayment too should have no give and be strong to support the tile floor properly. Cement board can be installed directly on top of the plywood layer.